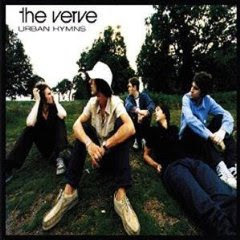 The Verve have always seemed to me like a kind of slightly more interesting Oasis, and they kind of are that. They are substantially more original even while stealing samples from the Stones and Ashcroft is a better writer and a substantially less annoying singer. That being said they never go much beyond competent. They create a foursome of competent power ballads in this album on which much of their fame is based and rightly so. Bittersweet Symphony, Sonnet, Dugs Don't Work and Lucky Man are all songs that defined not only the band but much of the year of 1997 into 1998. That being said the album as a whole is not really great. It is pretty good and I can easily understand how it became so popular but it is no masterpiece. So pretty good but not mind-blowing in any way. The Verve were known for their music's complex, immersive sonic textures. "Bitter Sweet Symphony" was a hit on both sides of the Atlantic, and remains the band's most well-known song. "The Drugs Don't Work", the Verve's only number one single in the UK, has become a concert staple for jam bands and other groups. The rest of the album alternates between wistful ballads like "Sonnet" and "Space and Time", spacey grooves like "Catching the Butterfly" and "The Rolling People", and all-out rockers like the Led Zeppelin-esque, pounding "Come On", which closes the album.